Look guys, I realize ROMA went into this awards season with a ton of buzz and, although I have no idea what the other journalists think after the first press screening this morning since reviews are still embargoed at the writing of this article, the general vibe is that everybody thinks it’s going to be amazing and can’t wait to call it a masterpiece. As much as I’d like to be that guy with the hot take, for me there’s just no two ways about it: this movie is transcendent. Written, directed and shot by Alfonso Cuarón, the Oscar winner’s follow-up to GRAVITY is very much the opposite type of film. As conceptually (and literally) high-flying as the space drama was, ROMA is earthbound in every sense – fragrantly, magnificently, so. The 70s-set story revolves around Cleo, a young live-in maid at a well-to-do middle class family in Mexico City. Cleo is quiet, mild-mannered, carries out her many chores and additional instructions from her mistress without complaint. She’s the one who does most of the tucking in and lullaby singing, so the four kids at the house love her. The appearance of a contented, harmonious existence notwithstanding, a scene on the rooftop where, after finishing laundry, she goes along with one of the boys and plays dead while gently remarking “It feels nice to be dead,” reveals the exhaustion in her bones. Well, Cleo’s world is going to get even more complicated when she sneaks off on an innocent double date to be with that cute boy Fermin who knows martial arts. This synopsis, or any other attempt at summarizing ROMA, might end up misleading because the truth is that this is less a plot-driven film than a cinematic experience of being transported back in space and time. To a place in memory where anything can still be a marvel and the ordinary is sacred. Sure, the fallout of Cleo dating Fermin, as well as the reason for the absence of the man of the house, Dr. Antonio, would drive the narrative forward to a touching, female-centric end. But what ROMA accomplishes first and foremost is creating this … world. A world of clearly defined socio-economic hierarchy, of pre-digitalized human interaction, of great political unrest, complete with its look, sound and smell. In minute, loving detail, Cuarón describes the Mexico City he grew up knowing, and that special tenderness and keeness of attention hypnotizes from frame one. In the aforementioned rooftop scene, we see two people catching a break next to fresh laundry dripping against a background of sunlit brilliance. The shot can hardly be called sophisticated and yet its simplicity, authenticity carries such evocative force you can practically feel the warm, lazy breeze on your face. Due to scheduling conflicts Cuarón had to do without his DP of choice, three-time Oscar winner Emmanuel Lubezki, and got behind the camera himself. The unlucky happenstance might prove to work in the picture’s favor as Cuarón brings not only stunningly refined visual craftsmanship but also that added personal touch. From deliberate pan shots of still, confined spaces or deadly, large-scale chaos, to smooth tracking shots of characters in restless/desperate motion, his eye for composition, tone and rhythm is unerring. A scene towards the end of the film where Cleo has to wade into the ocean despite her lack of swimming skills conveys all the emotional cues of the situation and dazzles with its sheer beauty. The logistics of festival coverage does not permit me to go on sharing more thoughts on this spellbinding film. Suffice it to say, this is the movie the maker of Y TU MAMÁ TAMBIÉN and CHILDREN OF MEN has been destined to make. It has the heart and piercing honesty of the former and the technical supremacy of the latter. Obviously some (very narrow-minded) folks would raise questions of partiality and it is too early for such predictions anyway, but Guillermo del Toro’s jury could well decide to award this film the Golden Lion. Even if that doesn’t pan out, many other awards and accolades would certainly follow, including likely Oscar noms for cinematography, director, foreign language film, and heck, maybe even best picture if its inherent “artsiness” doesn’t turn Academy members off. God knows it would deserve all of the above and then some. Another highly anticipated Oscar contender that screened right on the heels of ROMA and which received, by my count, the loudest applause so far, is Greek auteur Yorgos Lanthimos’ THE FAVOURITE. Lusciously designed and featuring a trio of fiery female performances and some acidicly funny dialogue, it’s a naughty crowdpleaser (at least in film festival terms) that could well also factor prominently into the Oscar race. 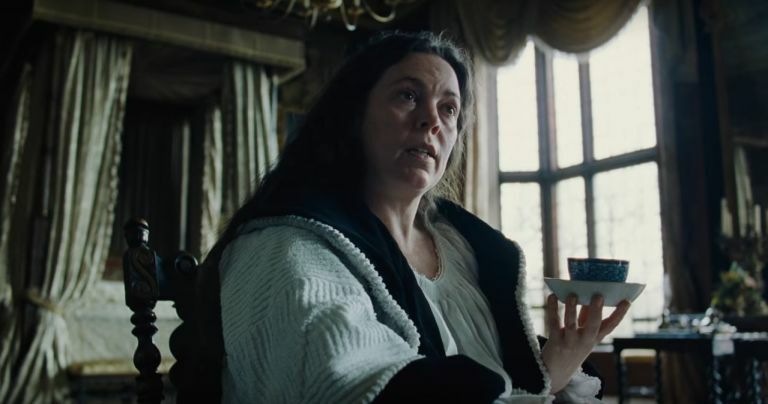 The mighty Olivia Colman plays Queen Anne in 18th century England, who’s nursing a bad leg infection. Faced with the difficult task of ending an extended war with France, she’s both mentally and physically reliant on her secret lover, Lady Sarah (Rachel Weisz). Meanwhile, a distant cousin of Lady Sarah, Abigail (Emma Stone), arrives on her doorstep a disgraced former Lady looking for a servant’s post and harboring the wish to restore her rank. After Abigail discovers the royal affair, she starts to play a game of seduction and manipulation that gets ugly pretty quickly. Fans of Lanthimos will probably need some time to acclimate to the grand period setting of this film. And it is indeed a major departure for the helmer of such wicked delights with a decidedly contemporary pulse as DOGTOOTH or THE LOBSTER. Once the central triangle takes shape and you get into the groove of the nasty dynamics, however, the habitual provocateur’s trademark dark comedy becomes hard to miss. Any number of dehumanizing, morally reprehensible acts are conveyed with deadpan and a barely concealed kick. Which could hit many wrong notes were it not for the fantastic performances of the three actresses. Colman, who you hopefully know and love as Hotel Manager from THE LOBSTER, is in majestic form here. Without compromising her impeccable comedic timing, she somehow manages to deliver a striking portrayal of someone deeply sad and tragically perceptive. The final shot of her distorted, incredibly exposed face gives the easily caricatured Queen Anne such depth and substance you can’t help but see her in a brand new light. Both Weisz and Stone are ace supporting players, perfecting the circle of love/abuse that’s absolutely riveting to watch. At this point, Sandy Powell’s costume and Alice Felton’s production design should be considered near-locks for Oscar noms. Ditto Robbie Ryan’s sumptuous cinematography. The screen time of the three actresses is split rather evenly, so there might be some confusion as to lead/support categorization, but all of them are worthy contenders regardless. The movie might prove a bit too quirky for screenplay/director/picture consideration, but if it can break out in a big way on the festival circuit, there’s no reason that can’t be overcome as well.